Wear OS smartwatches can store your music, which means you can still gain access to your favourite tunes when you go for a jog around the park. But how do you get your music on your smartwatch, and how do you link up your headphones to listen to them? Well, whatever Wear OS device you're using, from the Fossil Q Explorist HR to the Ticwatch E2, it's not a complicated procedure, and we're going to guide you all the way through it. If you're using a watch that hasn't been updated to Wear OS 2.0, we've got you covered too. Any questions or comments? Let us know in the comments section below. 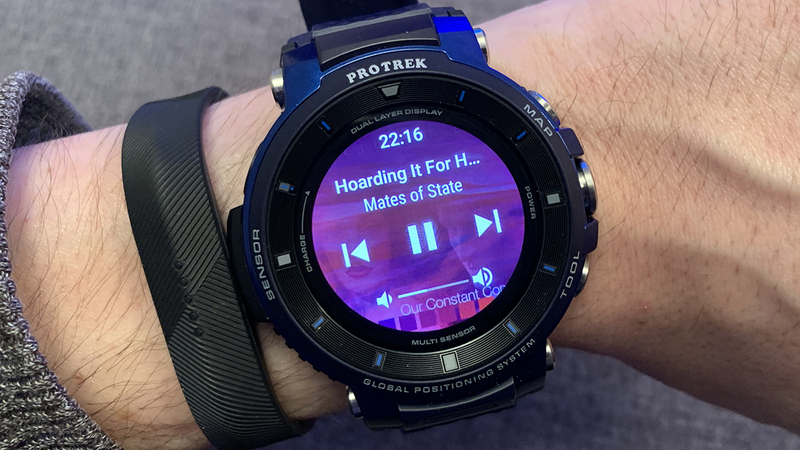 While you can control other music apps on your phone from your wrist, including Spotify, Google Play Music is currently the only one that lets you store and play music right from your watch, without any need for a phone connection. Google seems to be shifting its focus to YouTube Music now, but that hasn't yet trickled down to Wear OS. With the new and improved Wear OS 2.0, you can download the Play Music app straight to your wrist, so if it's not already installed, head to the Play Store app on your smartwatch and download it. Sign into your Google account on your watch and existing tracks and playlists that you've set up on the web or on your phone should appear here (if the right Google account isn't selected, this can be changed from the app settings). And if you're looking to create a playlist specifically for your Wear device, it's easiest to do this on the web first. Getting tracks downloaded is as easy as pressing and holding on the album or playlist you want to download, or tapping the download button to the top right. Assuming you're connected to a Wi-Fi or cell network, the tracks start syncing. If you pay for a premium subscription to Google Play Music, you can sync any tracks you like; if not, you can only sync the MP3s that you've uploaded to the service yourself. Note, too, that your smartwatch counts as one of the 10 devices you can use with the app. To see only the music that you've stored locally on your watch, scroll down to the bottom of the app's opening screen and tick the Show downloaded only box. Playlists that have been downloaded appear with a tick next to them. Not all Wear OS watches come with integrated speakers, and even if yours does, it won't be great for listening to music. You need to connect up some Bluetooth headphones for that early morning jog, if you haven't already done so. Head to Settings on your watch then choose Connectivity. Tap Bluetooth, then Available devices to look for your headphones, which need to be in pairing mode (check the instructions that came with the headphones if you're unsure about this). The playback controls in the Play Music app are all self-explanatory, with the centre button starting and stopping playback, and the ones to the side letting you skip tracks. Tap on the speaker button to adjust the volume. If you start playing music through Google Play Music on your phone, the same playback controls will automatically show up on your wrist, so you can adjust the volume, pause playback, and skip tracks without taking your phone out of your pocket. 4. Can you transfer Spotify music to Wear OS watches? If you prefer accessing your tunes through Spotify, there is now a dedicated app available for Wear OS. You can find and install it through the Play Store app on your wearable. You can use the Spotify app to browse through your playlists, to beam music to a connected device (like a smart speaker or your phone), and to control playback. If you need to start or stop the music, it can be done from your Wear OS device. What you can't do (at least not yet) is sync any music over to your Wear OS watch and play it straight from your wrist without a connection to your phone. If you're heading out with just your watch, you'll need to use Google Play Music. For those of you stuck on pre-2.0 versions of Wear OS (when it was still called Android Wear), the process is a little more fiddly, but it's still possible to get music on your watch. Again, Google Play Music is key, which you'll need to install on your smartphone rather than directly on your watch. From the Settings menu in the app on your phone you'll see an Android Wear section, which doesn't appear if you're connected to an Wear OS 2.0 or above watch. Toggle the Download to Android Wear switch to On, then tap Manage Wear downloads to choose which of your tracks to sync to the watch. It's actually a pretty straightforward process, but it does of course rely on you using your phone rather than your smartwatch to manage and sync your music, something Google wants to move away from.